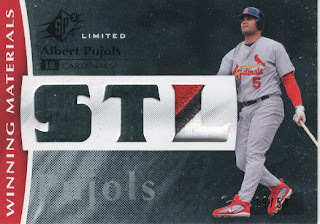 At the beginning of 2009 I wanted to try and get to 1,000 unique Pujols cards in my PC despite knowing that was a long shot, and would be quite an amazing feat. I believe I started the year around 349 cards or so, which wasn't terrible but was still missing around 65,000 cards according to Beckett (I really hope I'm exaggerating, I don't know how many off the top of my head). 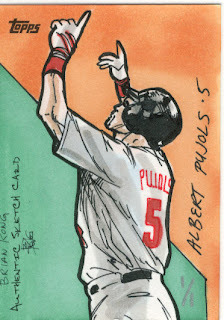 I have just finished logging in all the Pujols cards that have been sitting on my desk, and I have 764 unique Pujols cards to close out 2009. This year has been plentiful for my single card purchases, and terrible for hobby box breaks but it worked out much better. I really think I will continue to steer clear of hobby boxes for the most part in 2010 and use that money to buy single cards for my PC. It is so rare to pull a Pujols autograph that it's almost stupid to waste money trying. All in all, it was a very good year for me and Albert and I look forward to breaking the 1,000 card mark this year. Thanks to everyone who has traded with me this year, and sent me random Pujols cards out of the kindness of your heart. I don't plan on including any printing plates or 1/1's though in the 764/whatever tally. Just too impossible, and I really don't care for printing plates at all. Those three cards are amazing... maybe one day I'll pull an autograph of Pujols. Have a safe and positive 2010. Glad to hear your collection got heftier in '09. I took strides in my Halladay collection (like starting one).